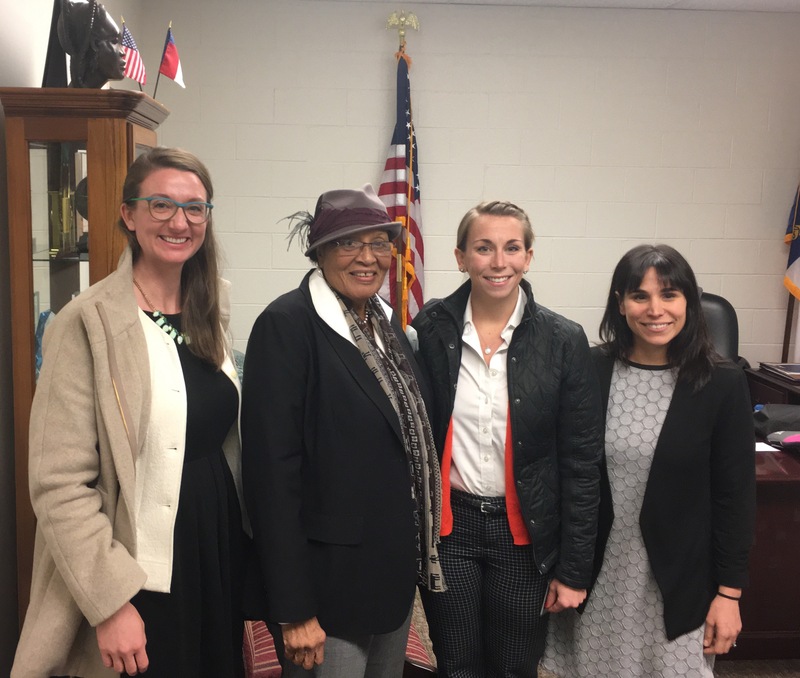 This afternoon the HappeningsCLT team met with congresswoman Alma Adams to discuss the state of the arts in our district and in the country. Although she did express the same concerns we have about the future of the National Endowment for the Arts, which is on the chopping block, she assured us she would fight to keep arts funding a part of our national budget. 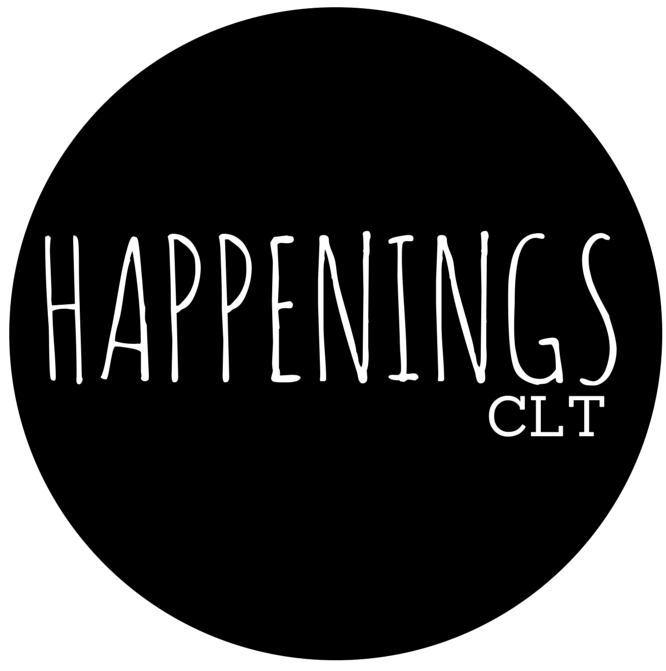 So many of Charlotte’s arts organizations receive the trickle-down money that is granted on behalf of the NEA (via the ASC, the NC Arts Council and other entities) . This would be a very different city without that money! We appreciate what Congresswoman Adams is doing and hope you join us in encouraging her to continue defending the arts. Congresswoman Adams has a PhD in Art Education and founded an art gallery that recently celebrated its 25th anniversary. She also taught art for 40 years at Bennett College before becoming a Congresswoman. Before we left, she gave us each a copy of this interview the NEA published about a year ago, which was their fourth most popular blog post of 2016. We think you’ll like it! U.S. Representative Alma Adams at work on an art piece. Photo courtesy of Rep. Adams. With a bachelor’s, master’s, and PhD in art education as well as 40 years as an art professor, U.S. Representative Alma Adams knows first-hand the powerful impact the arts can have not just on young learners, but on entire communities. 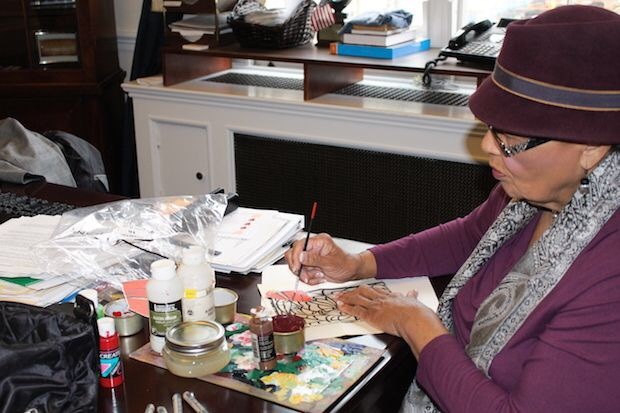 As she said to us in an e-mail interview, “I’ve learned that the arts are absolutely necessary and essential in helping to enrich our lives.” Representative Adams not only teaches about the arts, she also practices them as an accomplished printmaker. Read on to learn more about her early beginnings as an artist, why she passionately believes in arts education, and how her life as an artist has prepared her to be a legislator. NEA: What do you remember as your earliest engagement with the arts? ALMA ADAMS: I started drawing and noticing visual things around me when I was ten years old or younger. I was intrigued by detail, design, and shapes. At age 12, I entered a “Draw me contest” I found on the back of a pack of matches. I can’t remember who sponsored it, but I believe it was an Arts Institute in New York. They evaluated my work and sent me an outstanding review, but because I was not 16 I was encouraged to resubmit a drawing later. I never did that. I also remember being exposed to art in elementary school. My teacher allowed me to stay inside during recess, which came before science, to draw diagrams of our science project (parts of plants, etc.) for the class on the board. NEA: What led you to pursuing arts education as a profession? ADAMS: For me, the arts have been both an inspiration and a driving force that have consumed my life for most of my life. Although I really didn’t think I had the best teachers in high school, I knew I always wanted to be a good teacher and found myself working with my peers, helping them and sharing artistic ideas. When I entered college, I became more interested in my culture and heritage and in African-American art. I became acquainted with Eva Hamlin Miller, a tough but sincere teacher who had high expectations for her students and for me personally. Eva had two sons and I became the daughter she never had. She became my mentor and friend for more than 30 years. On January 13, 1991—11 months before her sudden death—Eva and I co-founded the African American Atelier Art Gallery in Greensboro, North Carolina. This year the gallery celebrated its 25th anniversary. After 25 years, our mission is to promote the works of African- American artists and to work in harmony with other ethnic groups. We continue to fill that void in our community. NEA: Why is it important to keep arts as part of the standard educational curriculum for our young people? ADAMS: I received all of my degrees (bachelor’s, master’s, PhD) in art education and taught art for more than 40 years at Bennett College in Greensboro, North Carolina. I have seen firsthand the power of the arts and how the study of the arts enhances teaching and learning. The arts are as basic to a child’s development as reading, writing, and arithmetic. Children need and depend on the arts to round out their lives and their ability to reason, to think, and to leverage ideas. The arts are accepting of all ages and present no barriers—especially to children who are natural creators, uninhibited by outside standards and rules. The arts allow children the freedom to express themselves in ways that no other venue can. Children are not hampered with the kinds of restrictions they are confronted with in other areas of study and are free to make their own judgments, because there are no right or wrong answers. The arts take the fears away for us all—especially children—and speak to us in a universal language that is genuine and pure. The arts indeed make us human. NEA: What life lessons do you think you’ve learned particularly because of your work as an artist and your engagement in the arts? ADAMS: While some believe the arts are nice, and indeed they are, I’ve learned that the arts are absolutely necessary and essential in helping to enrich our lives. The arts are a universal language that speaks to people everywhere and helps them to understand some of the most complicated of issues. The arts contribute to the economic vitality of all communities and provide the creative discourse we need to survive. NEA: What do you think you’ve learned from being a working artist that helps you with your job as a legislator? ADAMS: I am a visual artist—a visual storyteller who can think outside of the box, knows how to fix, repair, and construct things that are new and, sometimes, not-so-new. I’m able to make sense of things that might be complicated to some and often times unusual. I have found many ways to solve problems as an artist and have been good at sharing new ideas with others. I believe those skills, accompanied with my natural inclination to teach, have helped me to inform other lawmakers and to get things done. NEA: You have an active art practice as a printmaker. What do you feel you can express as a printmaker that you can’t with other art forms? How do you make time for your art practice given your busy schedule? ADAMS: Being a printmaker allows me to think beyond what is actually there and often see the impossible. As a printmaker I do my work in pieces—putting things together, making compositions, and bringing things to life to produce my work. It’s difficult to make time to create, but I haven’t stopped trying. I created one small diptych (serigraph collage) in January and I try to do some creating during district work periods when I’m home and have a few spare moments or when I can find time in the evenings when I’m in DC. NEA: As you mentioned earlier, you were one of the founders of the African American Atelier. What was the lack that made Atelier necessary? What did you hope it would do for the community? ADAMS: There was no full-time African-American presence of artists in the community in 1991 and no stand-alone gallery or place for African-American artists to showcase their work in my community. Eva Hamlin Miller and I co-founded Atelier to fill that void and to highlight the culture and heritage and to showcase the works of African-American art by African-American artists every day, every month, and every year. Eva and I knew that to be true to the responsibilities and mandate that we believed we had it was absolutely essential to have an adequate space and venue to provide exposure for artists to begin this education process for artists, the community, and our organization as well. We knew that celebrating and accepting diversity needed to begin with an awareness of one’s culture and an appreciation of differences. Atelier has a year-round youth program that serves youth from low-income communities. It uses the visual arts to engage children in visual arts expression, which will help them better understand their heritage, and it also enhances their self-esteem. The programs are free to youth because we believe all children should be able to engage in the arts and money should not be a barrier. NEA: During Black History Month you have been celebrating African-American artists, why do you think it’s important to recognize artists during this month? NEA: What do you think is the role of the artist in the community? ADAMS: To inform, educate, empower, and motivate audiences to better understand themselves and others. Noted African-American scholar, artist, and educator Dr. Samella Lewis reminded us that African-American artists have a primary obligation to the community: to understand and use elements of their cultural heritage; to produce an art which is diverse (reflecting our diverse interests, materials, and techniques); and communicate messages to the audiences it is intended to reach. Above all, artists have an obligation to personally understand the power of art and use that power to inform and educate. NEA: Any advice for young artists? ADAMS: Keep working and connecting with other artists, facilities, and galleries to get your work before the public. No one will ever get to know you or your work if you keep your work to yourself. Be aggressive in promoting and presenting your art and yourself for public view, opinion, and, ultimately, for support. ADAMS: The arts make us human and are an extension of who we are and what we hope to be. A community cannot survive without a healthy arts environment.